commercial sources — collected and presented here exclusively for you. 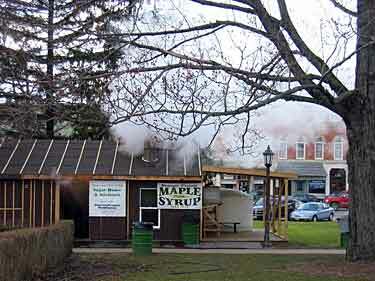 The inspiration for this layout came from a visit in early March to Chardon, Ohio, where a “sugar house” had been set up in the town square (left above) to boil down maple sap into maple syrup as part of the Geauga County Maple Festival. It’s a great scene to photograph, with clouds of steam filling both the skies and the inside of the sugar house (right photo). The two guys working in this photo are cleaning the filter in the evaporator, which does the boiling. The fllter insures that the finished product (on the shelf in front) is pure. A little Internet research showed me that western Pennsylvania, where I live, is also a maple-syrup producing locale, with most of the activity being small farms which use the sap from their own sugar bushes (groves of sugar maple trees). Somerset County, an hour east of my home, is a leading producer. Here was an irresistible prototype, very close to home! Work started almost immediately. The initial plan called for a small, independently-owned sugar house situated in Somerset County, Pennsylvania. 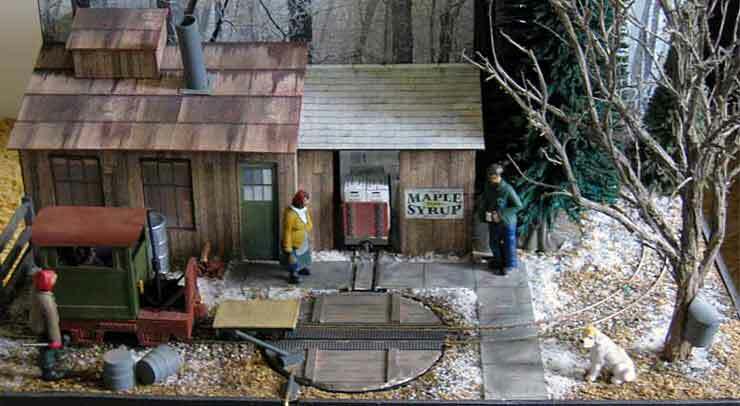 The farm owner was also a narrow-gauge fan, so he built a small 15-inch gauge railway to bring the sap in from the woods to the sugar house and to haul the finished product out to the road, where trucks (lorries) would pick it up and whisk it away to America’s breakfast tables. The envisioned plan was a variation of John Stuart Mill, a design by Emrys Hopkins. 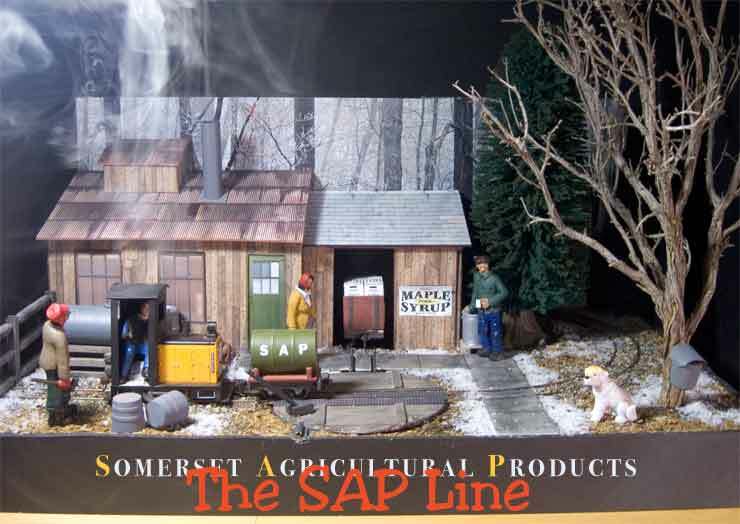 The Somerset Agricultural Products (SAP) Line was designed as a true micro layout, measuring 20x14in (51x36cm). I made the foundation from black foamcore board, 3/16in thick, laminating the baseboard from three layers of 20x14in foamcore. Then I hotglued a 2in wide box all way around to give support and strength. 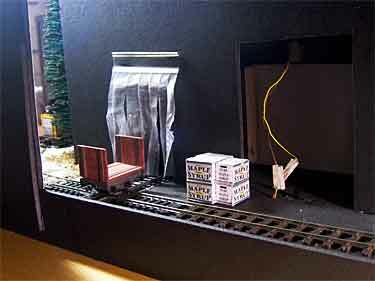 The initial mockup (above left) used Peco On30 flex track. The rails were slid out of the tie-strip and run through a Roy O. Link rail bender to produce a smooth 5in radius curve. The rails were then reinserted in the tie-strip, and the 180-degree curve laid so the two entrances were 12in apart, providing a natural easement to the tight curve. I had to shim the Atlas 90-degree crossing to match the Peco track height. There are no turnouts on the line. A small turntable replaces a turnout leading into the building annex, where bottling and packing take place. The table was made from a CD and its case, and construction details can be found here. The right-hand photo (above) shows all these details glued into place and the first computer-printed building walls being fitted. In the next stage (above left), the computer-printed building walls and roofs have been glued to 1/8in mat board (from the art supplies store), cut out and fitted in place. See the Sources section below for more information. The dual backdrops have also been printed to size (they’re 8in high), mounted on black foamcore, and installed. They came from the Internet — you can google “winter forest” to find dozens of potential backdrop photos. 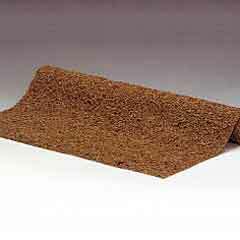 The next stage shows progress made in ground cover by gluing a LeMax mat to the baseboard (details under Sources below). The right-angled sidewalk is made from a plastic-like material called Sintra, provided by my friend, Jim Sacco of Clty Classics models, who uses it to build excellent HO streets. You can get offcuts of it at almost any sign-maker’s shop. And a major step was the addition of a 12in high sugar maple model at the right front corner. This is a sage armature from FSM Trees. 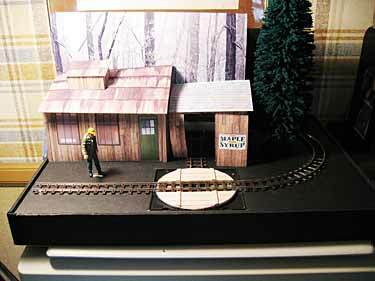 This tree, along with the sugar house, became a focal point of the layout. The plan and positioning of the layout can be seen from this aerial photo of the finished project, as viewed from a position at the rear. 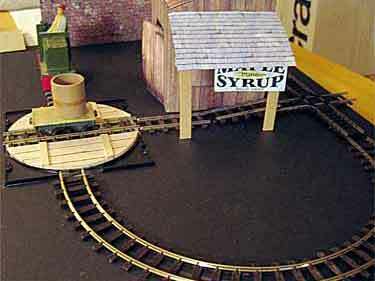 Trains are made up in the fiddle yard (black area) and then sent out “on stage” around the bend and across the turntable to the sugar house. Notice that the backdrop is divided into two offset sections. This scheme provides two planes for the action, is more interesting to view, and makes the trains’ exits to the fiddle yard seem farther away from the sugar house. This photo also makes the role of the turntable pretty clear. The table is just long enough to hold one car and a small loco. 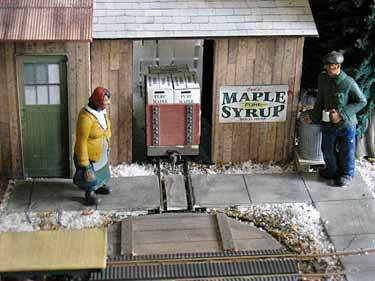 It’s used to turn the loco from the main line to the spur that runs into the building, so it can pick up a load of maple-syrup crates that awaits just inside. The sequence below explains how this gimmick works. (Left) The stack of crates is pre-assembled from computer-printed box patterns and waits beside the fiddle track. A four-wheeled bulkhead flat is teed up on the crossing. (Right) An Invisible Hand loads the crates onto the flat. 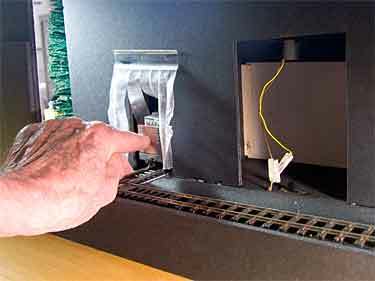 (Left) The Invisible Finger pushes the loaded flat through the doorway covered with translucent plastic strips (a baggie, cut and sprayed with Dullcote). The wiring at the right of these backstage photos is the electrical leads to the Seuthe smoke unit in the chimney, which creates all the steam that is so characeristic of sugar houses. More about that later. (Right) Viewed from the front the car, now visible to the audience, awaits pickup by the loco. The whole sequence works easily and, from the audience’s point of view, looks quite natural and prototypical. 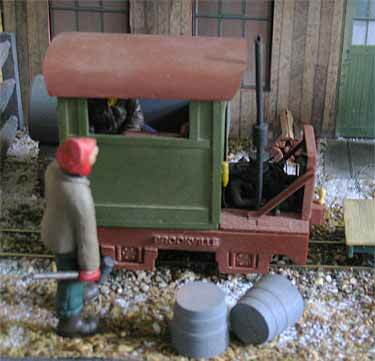 Small railway cars would often be pushed into position by hand. 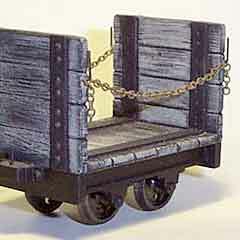 As you’ve probably noticed, there are only two cars on the SAP Line, both four-wheeled wagons from Sidelines Models (see Sources below). The SAP tank car, used for bringing sap in from the woods to the sugar house, is a converted water car with the pump omitted. The bulkhead flat is a standard Gn15 wagon. Although in real life this little line would no doubt own only one locomotive, in this model we have two. The owner is a train fan, after all. The Davenport gas-mechanical four-wheeler (left above) is a stock Bachmann loco with a conversion cab from Sidelines Models. 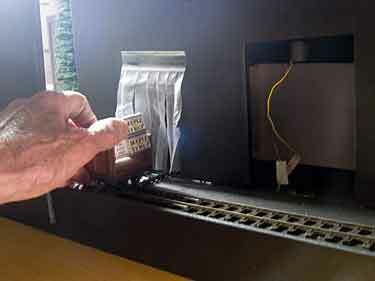 It’s a very simple conversion — just remove the Bachmann cab, assemble the conversion cab, paint it, and push it into place. The driver is an LGB figure. He sits sideways so he can look with ease in both directions. On this line, the locos spend exactly half their time running in reverse! The Brookville loco (above right) is a “must have” engine for this railroad, because Brookville, Pennsylvania is just an hour up the road from the Somerset County location of the modeled sugar house! This loco is a 1½-ton model, the smallest that the Brookville Works turned out. It was originally a two-foot gauge engine, but has been regauged to 15 inches (actually 16.5mm) to run on the SAP Line. 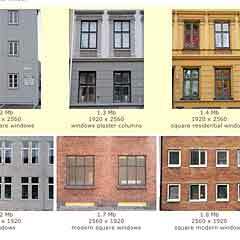 The model is offered by Schomberg Scale Models (see Sources below), who also provided the rest of the figures on the layout. There’s one final effect that cements the audience’s involvement in this little switching layout. 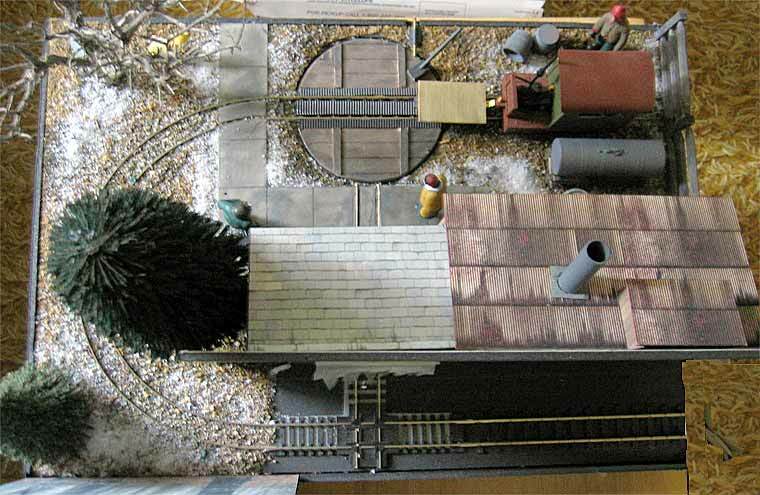 In the sugar house chimney is a small Seuthe smoke unit, connected to the AC terminals of the MRC power pack that drives the layout. 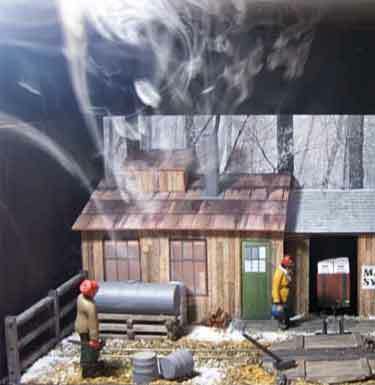 Smoke fluid is introduced with an eye dropper into the chimney top, and this efficient unit does a great job of generating the large clouds of steam that perpetually surround an operating sugar house. Later I swapped out this smoke generator with a larger Aristo-Craft G-scale smoke unit (purchased from Micro Mark, catalog #82602). This unit has a fluid reservoir and contains a fan that really pumps out the steam. These photos were taken while the Seuthe unit was in place and doing a good job. Audiences enjoy this Vesuvial effect, but there’s more. Soon, the room begins to fill with the delicious smell of maple sugar! This convincing touch of realism is produced by using scented smoke fluid from Mega-Steam. It’s the ultimate crowd-pleaser … I call it the Arendt Aromarama. It really brings the audience, salivating, into the layout! Most of the questions I’ve received as a result of the SAP Line’s appearance in the NG&SL Gazette have involved “Where did you get…?” inquiries. This section answers most of those questions. Sidelines Models, in Exeter, England was the originator of Gn15 commercial train models, and it’s still the largest. 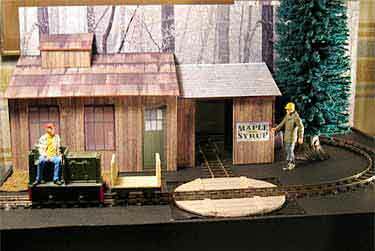 The SAP Line uses a Bachmann cab conversion kit, a water wagon, and a bulkhead flatcar from Sidelines. You can see their products at Pepper7. Schomberg Scale Models, in Ontario, Canada makes a growing range of Gn15 models and detail parts. 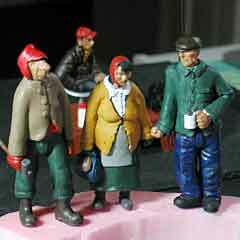 Besides their Winky Brookville diesel, the SAP Line uses several of their G figures—the only ones I could find wearing winter coats! SSM’s full catalog is online. 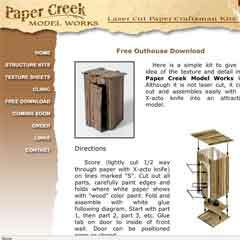 Paper Creek Model Works offers a broad and delightfully realistic line of paper model kits and texture papers. The walls of the SAP Line sugar house came from a texture sheet provided as part of a free download—an outhouse model—on their website. Mayang.com is an Aladdin’s cave of downloadable textures and architectural details. The roofs, windows, and doors on the SAP came from their enormous website. 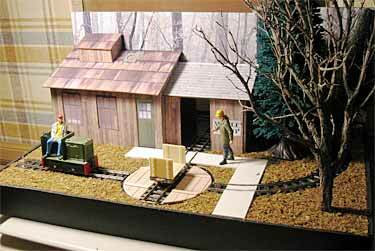 LeMax offers a broad range of Christmas Village items, many of them useful for railroad modelers. Their moss mat exactly matches the color and texture of a late winter forest floor. 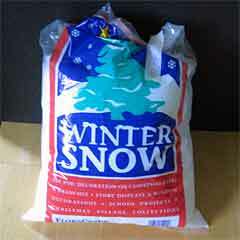 Artificial snow is available by the bag year-round at many arts and crafts supply stores. It’s used by display makers. I got mine in late March at my local shop.